Copenhagenize.com - Bicycle Urbanism by Design: Helmets or Health? For those who follow this blog it can hardly be a secret that we firmly believe that bicycle helmets should be a private matter and a personal choice - and that helmet promotion and legislation are the greatest threats to bicycle culture since the dawn of the automobile age. I had a discussion the other day with a friend from England regarding our campaign against helmet promotion here in Denmark on Cykelhjelm.org. We agreed that it's a weighty task and the message is a challenge to get across. There's all the science about what protection a helmet actually provides and then there's the whole societal issue about the effects of helmet promotion. What do we want for society as a whole? A. More people in bike helmets? B. More people on bikes? You can't have both as common sense and the existing data will suggest. For me B. is the obvious choice. 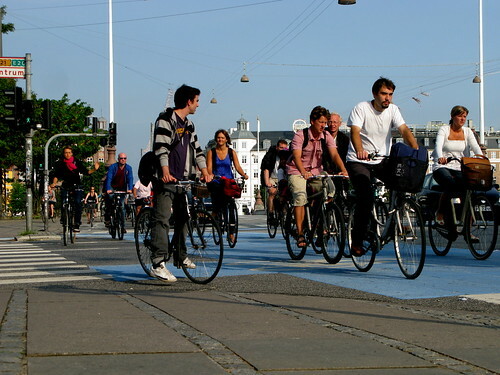 The health and societal benefits are far greater when more people get onto bikes. A fall in illnesses like diabetes, heart disease and certain forms of cancer, a fall in obesity and a rise in productivity and life expectancy. Good for society. What do you choose? One answer only, please. One of the perks of having this blog is that I've made the acquaintence of many bicycle advocates from around the world. Either visiting Copenhagen to research our bike culture or through ongoing email conversations. Advocates, urban planners, policy makers in transport departments, municipal officals, bike organisations, what have you, from all over the world. It's amazing to exchange views and experiences. Many of you know how touchy the helmet debate can be. This was underlined for me the other day. I've had a pleasant, extended email conversation with a municipal offical in a medium-sized American city that is making an effort to plant the seeds of bike culture. It was, for ages, a fine and good exchange punctuated with enthusiasm and good karma. It all changed rather rapidly when I started blogging more about helmet promotion and helmets. I recieved a 'Dear John' email stating that our 'relationship' was over. Ridiculous and childish, yes. It was cause to roll my eyes and sigh, but nothing more than that. Helmets had come between us and my opinions about them were too much for this policy maker. - Helmet advocates sell helmets and fear is their greatest marketing tool. And legislators who vote for helmet laws sell helmets through a sad cocktail of ignorance and 'passing the buck' - exposing their own inability and unwillingness to develop safe infrastructure for bicycles. - Bicycle advocates, on the other hand, sell urban cycling and they do so for the greater good. And they use science to sell their wares. Period. So if you meet a 'bicycle advocate' who starts waffling on about helmets - run. Or rather ride away. I know, I know. Things are different here in Europe. We have 100 million daily cyclists and very, very few wear helmets. We do have vocal political bodies and organisations like the EU, the WHO and the European Cyclists' Federation who all warn against helmet promotion and legislation because it effectively kills off bicycle culture and because the health and societal benefits of people cycling are much more important. Once again. Choose A. or choose B. As above. Now that Australia has become the fattest nation in the western world [26% of the population are obese - 25% in the USA], the country's destructive helmet laws are in the spotlight once again. Read more about this here. In addition to gaining a fruitful network of bicycle advocates, starting this helmet research and analysis has put me into contact with a growing number of people who share the same concerns. Information and experience is exchanged, research studies that can be difficult to obtain are made available. Words of encouragement fly electronically across borders and seas. There are a couple of good interviews over at Cykelhjelm.org in English. One is with Morten Lange, head of the Icelandic Cyclists' Federation, member of the European Cyclists' Federation's Helmet Group. The other interview is with Carlton Reid Esq. of Bikebiz.com and quickrelease.tv fame. One kindred spirit emailed this interesting point: For every one life 'allegedly' saved by a bike helmet on a bike we could save 20 lives of motorists and passengers if they, too wore the helmets. And don't forget the pedestrians. Come on people!!! Don't we want to save lives!!?? And where are the helmet manufacturers on this issue? Think how many helmets they could sell! Alas, if only helmet advocates were equipped with logic and science. I read the other day 37,000 people drown each year in Europe. A helmet is not an effective piece of equipment for saving lives but a lifevest most certainly is. I want to see all these people branch out into lifevest promotion and legislation. No child left unprotected in the swimming pools and on the beaches. Come on. Get started.